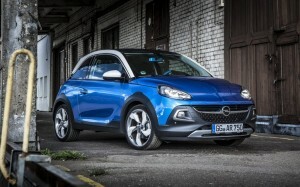 Opel is adding a cabrio version to its Opel Adam city car range. The ‘adventure-loving open-air car’, the Adam Rocks arrives in Ireland next month. It differs from the original Adam through increased height and ‘distinctive body cladding’, as well as an electrically folding swing top canvas roof. The Adam Rocks will be available in a choice of a 1.4-litre 100hp five-speed petrol engine and a new six-speed model powered by an all new 1.0 115hp ECOTEC Direct Injection Turbo petrol engine. The ECOTEC has a top speed of 196km and 0-100kph acceleration time of 9.9 seconds. Managing director of Opel Ireland, Dave Sheeran said: ‘The Adam Rocks is fun, it can be individualised like no other car and blends attitude with adventure. The Swing Top canvas roof opens in five seconds and can be operated while the car is moving, at speeds of up to 140kph. Adam Rocks also features Opel’s IntelliLink infotainment system. The Adam Rocks arrives in Ireland in October, with prices starting from €18,995. Visit the Opel Ireland website or its Facebook page for further details.